Last October we introduced readers to the world of cargo ship cruising. Since then, the crash in freight rates and charter hire, drop in the price of fuel and the activities of pirates, not to mention the large number of new ships being delivered from orders placed before the recession, have led to some interesting changes. The even slower boat to China, for example, now gets there via the Cape of Good Hope instead of the Suez Canal. But one of the biggest and fastest passenger-carrying container ships connects New York and Seattle by way of the Suez Canal. And CMA CGM The French Line is introducing seventeen giants and super-giants into the cargo-passenger trades. Even Transatlantic service between the US, the UK and Continetal Europe has returned. Let's look at some of these changes. Last autumn, we reported that container ships trading between Europe and China had extended round voyage durations from 56 to 63 and then to 70 days (i.e. from 8 weeks to 9 and then to 10). Each extra week required the addition of one more ship to the string to maintain a weekly frequency, so that 10 ships are required to maintain weekly service on a 70-day round voyage. The reason for these voyage extensions was slow steaming to reduce fuel consumption after the price of bunker fuel had skyrocketed. Since then, however, the price of fuel has dropped again and the world has given the lines two entirely different reasons to maintain the longer voyage durations. First, many lines have gained an advantage because of huge drops in daily charter hire rates for container ships, which allow them to keep voyage durations extended or operate more ships on one route at virtually no extra cost. (Savings can also be gained by chopping some routes where trade tonnages have declined). Another related reason is the activity of pirates in the Gulf of Aden. Although fast container ships are not good targets, one slower passenger-carrying ship, the Bank Line's Boularibank, was recently attached with 11 passengers on board. Of the passenger-carrying lines, both CMA CGM and Evergreen Line have for the time being decided to route China-bound ships from Europe via the Cape of Good Hope instead of the Suez Canal, although they still return via Suez. For these reasons, and until things change again, this means that while just a year ago lines were operating ships on a 56-day turnaround the trend today is toward 70 days. This can mean an extra week in getting to China. Going against this grain, however, is a very interesting new route that connects New York and Seattle (and Vancouver BC) by way of the Suez Canal. The first ship on this route is the CMA CGM Verlaine, which is capable of carrying 6,456 twenty-foot equivalent containers at a fast speed of 25.8 knots, certainly enough to keep away pirates. The key to this routing of course is that the Verlaine is a post-Panamax ship, meaning that, with dimensions of 984 feet in length by 131 feet in beam, she is too large to transit the present Panama Canal, where the maximum width allowed is 106 feet. The Port of New York has for some time now been trying to develop its Far East trade in bigger ships using the Suez Canal. 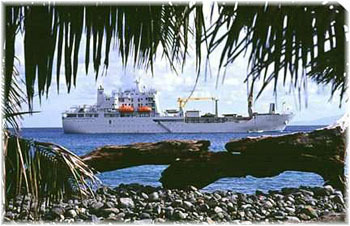 In this case, however, the ship serves not only New York but also the Trans-Pacific trades to Seattle and Vancouver. Uniquely, this gives American passengers an opportunity to travel around the world by crossing their one country by rail at the beginning or end of their voyage between New York and Seattle, something that harks back to the first round-the-world cruise of the s.s. Cleveland, which sailed from New York 100 years ago, in December 1909, and arrived in San Francisco in February 1910. The Panama Canal would not open until 1914. Although Zim Container Service began its so-called "Tri-Continent" service in 1971, it has not until now carried passengers. 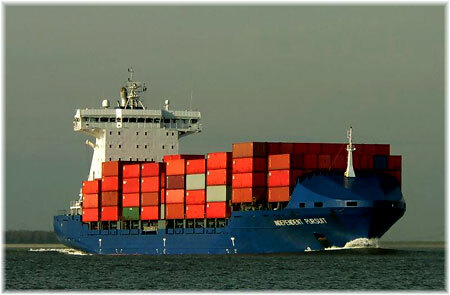 But for the first time this year, passengers are being carried in two German-owned container ships that have been chartered from NSB for this route that connects the Mediterranean to the Far East via North America. 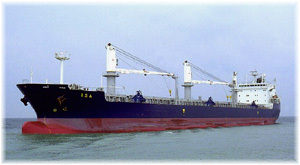 Two new ships, the Zim Ontario and Zim San Francisco, have been added to the route, which after leaving Haifa calls at Livorno, Genoa and Tarragona before crossing the Atlantic to Halifax, New York, Savannah and Kingston, Jamaica, and then transits the Panama Canal to Long Beach and Oakland before crossing the Pacific to Shekou, Hong Kong, Ningpo and Shanghai. The ships then cross the Pacific again to Balboa, transit the Panama to Kingston, Savannah, New York and Halifax once more and cross back to Tarragona and Haifa. The full round voyage takes 104 days but one-way and port-to-port sectors can also be booked. These ships, delivered just this year, have three double cabins and fares run at €90-95 per person per day double or €105-110 per day single plus dues and taxes. One company making great strides in the cargo-passenger trades is CMA CGM The French Line, now the third largest container line in the world. 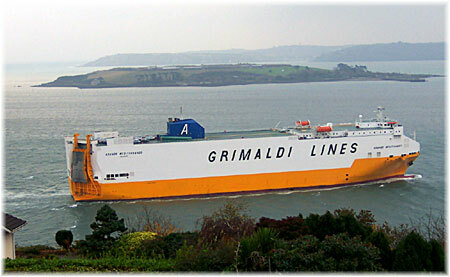 In commemoration of the line's illustrious maritime history, that included great ocean liners such as the Paris, Ile de France, Normandie, Liberté and the France, chairman Jacques Sadée decided some years ago that new cargo ships should continue this tradition by being outfitted to carry passengers on their voyages worldwide. He is now holding true to his word. A week after our last column on this subject, CMA CGM accepted delivery of its biggest ship yet, a seriously fast and huge vessel, capable of carrying 11,000 twenty-foot equivalent containers at 24.2 knots, called the CMA CGM Vela. With a gross tonnage of 128,600 tons, only nine cruise ships in service or on order exceed her. Her dimensions of 1,140 by 148 feet exceed those of the Queen Mary 2 (1,132 x 135) and she is almost as large as Royal Caribbean's new Oasis of the Seas (1,181 x 154). However, with three double cabins and one single she has space for only 7 passengers, compared to 7,000 (a thousand times more) that can be accommodated on Oasis of the Seas. Fares on the CMA CGM Vela run €95-100 per person per day double or €110-120 per day for sole use, plus dues and taxes. But the lone traveller gains a big advantage as the single cabin is only €90 per day. In addition to the CMA CGM Vela, which is chartered from German operator NSB, CMA CGM will be taking delivery of nine more giants for its own account in 2009. Sister ships of the CMA CGM Vela, the CMA CGM Hydra, Musca and Thalassa, will carry up to 11,000 twenty-foot containers, while five more, the CMA CGM Andromeda, Aquila, Leo, Libra and Lyra, will be capable of 11,400, and one, the CMA CGM Christophe Colomb, will replace the CMA CGM Vela as the largest passenger-carrying cargo ship in the world, at 13,300 twenty-foot equivalents. All will be French-flag and French-crewed except the CMA CGM Christophe Colomb and Thalassa, which will be British-flag and registered to CMA CGM (UK) Ltd. Typical of French ships, all will be fitted to carry 10 passengers except the CMA CGM Hydra, Musca and Thalassa, which will carry 8, more than the German ships, that usually carry only between 4 and 7 passengers. The CMA CGM Christophe Colomb, for delivery at the end of 2009, is only the first of eight super-giants. The others in this "Explorer" class will be the CMA CGM Marco Polo, Vasco de Gama, Amerigo Vespucci, Corte Real, La Pérouse, Magellan and CMA CGM Zheng, and at 1,181 feet in length they will match the Oasis of the Seas. To be one of 10 passengers on a ship as large as the Oasis will surely be a different experience. Passengers who travel with CMA CGM are accommodated in outside cabins and take breakfast in their own lounge while lunch and dinner, which include complimentary French table wine, Chateau Paquebot, are served in the officers mess. The fare for the full 70-day round voyage from Southampton via Hamburg, Rotterdam, Zeebrugge, Le Havre and Malta to Khor Fakkan (UAE), Chiwan, and on to Pusan and Kwangyang in South Korea, then back via Dalian, Tianjin Xingang, Shanghai, Hong Kong, Yantian, Singapore and Port Kelang and to Southampton via Tangiers is €6,900 per person double or €7,179 for sole use of a double stateroom, but one-way and part voyages are also available. Valid until the end of 2009, the Italian operator Grimaldi Lines has announced a 20% saving on all new round voyage bookings on its Euro Med, Euro Aegean and Euro Adriatic services. At last count, the Italian operator had thirty cargo ships carrying passengers, and in their case twelve per ship, the maximum allowed before a vessel becomes classed as a passenger ship. 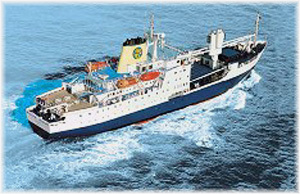 The Euro Med service, based in Salerno, runs weekly, from a British or American passengers point of view, giving a full tour of the Mediterranean to Salerno, Piraeus, Izmir, Alexandria, Limassol, Ashdod and returning via Salerno, Savona and Setubal to Bristol, then running up to Scandinavia at Esbjerg and Wallhamn and returning via Antwerp to Southampton 35 days later. Round voyage fares in outside cabins, before discount, run from €2,640 to €3,366 per person in double occupancy and single fares between €3,366 and €5,049. The Euro Aegean service runs from Southampton to different ports, calling on Flushing, Hamburg, Antwerp and Bristol and then on to Setubal, Casablanca, Valencia, Livorno, Civitavecchia and Salerno in the Western Mediterranean, then to Piraeus and Alexandria, and every second voyage to Beirut, Tartous, Lattakia and Mersin, weekly again to Gemlik and Yenasoy in Turkey, thence back to Salerno, Valencia and Southampton. What used to be a 28-day round voyage can sometimes now be 38 days. Round voyage fares in outside cabins, before discount, start at €2,128 per person in double occupancy and single fares begin at €2,713 for the standard 28-day round trip. The Euro Adriatic service runs weekly from Monfalcone to Piraeus, Haifa and Ashdod, and returns via Izmir, Ravenna and Koper to Monfalcone, about 14 days later. Round voyage fares for all three of these services are now being discounted at 20%, but it is worth bearing in mind that Grimaldi Lines is the only cargo line carrying passengers that includes inside cabins in their offerings. Round voyage fares in outside cabins, before discount, start at €910 per person in double occupancy and single fares begin at €1,404 for the standard 14-day round trip. Completing the Grimaldi Lines schedules, it also offers 58-day round voyages from Tilbury to Brazil, Argentina and Uruguay and 38-day round voyages from Tilbury to West Africa. In October the Cruise Examiner bemoaned the fact that since 2007 there had been no direct service between the US East Coast and the UK and North Continental ports. This, we are pleased to report, has now been remedied as the ships operating on the Independent Container Line route between Antwerp and Liverpool and on the American side, Philadelphia (Chester, PA) and Wilmington, NC, have reinstated their passenger service. Whether this had anything to do with the American election is not known but the service was re-opened shortly after President Obama's inauguration. Two of the ships, the Independent Pursuit and Venture, carry six passengers each, while the other two, the Independent Accord and Concept, carry just two passengers in an Owners Cabin, should one feel like having a ship to themselves. One-way passengers are accepted and while disembarkation in Europe is only allowed at Antwerp, the UK is within quick reach by Eurostar to London St Pancras. The Eurostar station in Brussels is just a 45-minute train journey from Antwerp Central Station. Typical fares are €1,573 from Wilmington to Antwerp or €1,438 from Liverpool to Chester, in each case per person in a double cabin, with single fares about 20% more. Google is a good source for most things but there are a few specialist travel agents who book freighter voyages. These are located mainly in the UK, France, Germany, Switzerland, Italy and the Netherlands, as well as in the US and Canada, and one each in Australia and New Zealand. A good one-stop source for detailed information is Richard Ahern's "Internet Guide to Freighter Travel," but "The Man in Seat 61 in the UK," who specialises in rail travel, also has links to some freighter agents. For answers to most of your questions, however, the most complete source is still the Internet Guide to Freighter Travel, which has been put together by a freighter traveller and has been on line for ten years now.